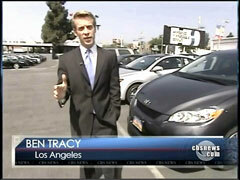 On Thursday’s CBS Evening News, correspondent Ben Tracy reported on the ending of the problem-ridden Cash for Clunkers car buying program, but spun it this way: "Thanks to Cash for Clunkers, what could have been a dismal summer for car sales now has a Hollywood ending....But now, the wildly successful program that provided up to $4500 per clunker is being scrapped." Tracy visited a Los Angeles Toyota car dealership, hence the Hollywood reference, and spoke with owner Don Mushin who explained: "We normally sell about 300 cars a month. We’re on track this month to do about 600." However, Tracy went on to acknowledge: "Yet, there have been problems. Dealers have to front the money for the rebates, sometimes to the tune of hundreds of thousands of dollars, and the government has been slow to pay them back.."
On Wednesday’s CBS Evening News, correspondent Ben Tracy filed a report linking angry protesters opposing ObamaCare at town hall events to conservative groups, examining the possibility that the "outrage" has been "organized" by these groups, or even affected by "anti-government" sentiment over other issues, rather than legitimate concerns about the plans under consideration. Tracy began his report: "For some, their anger is tightly focused on health care reform. But for others, this issue is simply the final straw." After a soundbite of a woman complaining about the legalization of abortion and the removal of prayer from public schools, Tracy continued: "Some experts believe a growing anti-government sentiment, fueled by extraordinary events such as the bailouts of the banking and auto industries, is spilling over into the health care debate." Notably, eight minutes after the end of Tracy’s report, a piece was run in which correspondent Bob Orr relayed concerns by the liberal Southern Poverty Law Center about right-wing extremism motivated by "anti-government" sentiment, Democratic party control of the government, and the first black President, and the possibility of violence from these extreme groups in the near future. Mexican law makes it nearly impossible to buy guns there legally, but less restrictive gun laws in the U.S. keep the firearms flowing over the border. Court papers in the [George] Iknadosian case claim U.S. border states provide three-quarters of black market firearms to Mexico. And with more than 1,000 people already killed in drug violence in Mexico this year, cutting off the gun supply is now a top concern on this side of the border. "Don't know much about history, don't know much biology." Those famous lyrics from Sam Cooke's 1958 song, "Wonderful World," never rang truer than today. American students continue to test far behind the highest performing nations in science and math, according to the American Institutes for Research. And many would be hard pressed to name the three branches of government or the authors of the Constitution. But they are learning their environmental dos and don'ts. And, as the Jan. 27th CBS "Evening News" showed, the best students have truly internalized their green indoctrination. That broadcast dedicated over two and a half minutes to children determined to live a "green" lifestyle. The children in this segment don't just recycle or turn off the lights; they have convinced their parents to buy eco-friendly light bulbs, wash their clothes in cold water, and even get an "untraditional" Christmas tree they could replant in the backyard. On Tuesday’s CBS Early Show, fill-in co-host Chris Wragge seemed to feel sorry for Barack Obama having to withstand the media spotlight while vacationing in Hawaii: "Coming up, life in the media bubble. How is Barack Obama adjusting to the press following his every move?" However, as correspondent Ben Tracy later reported, that spotlight is not exactly harsh: "Tours of Obama's childhood stop at the apartment building where he grew up, a favorite lunch hangout, and the ice cream store where he had his first job. Tourist shops are also riding the Obama wave. The soon-to-be president is already a global celebrity." Tracy began the reported by lamenting: "...the other day, the president-elect just wanted to eat his tuna sandwich. This vacation has been a bit of a reality check as to how little privacy Obama now has...He at times bristles at the constant media coverage...Yet at others, offers to buy reporters dessert." Tracy concluded the report by declaring: "And the media's trying to strike a balance between covering the person who's about to be the most powerful man in the world and also giving him his space to just be himself." I call myself whole life, which means I don't just believe in that little girl before she's born but I believe that it's important to care about after she's born, whether she's poor, whether she's educated. With Starbucks’ announcement that it will closing 600 of its locations nationwide, the network morning shows on Wednesday heralded this news as another sign of a bad economy. ABC’s Bianna Golodryga on "Good Morning America" lamented that "Americans are struggling just to pay for a cup of Starbucks coffee." NBC’s Matt Lauer’s clever headline: "Trouble brewing -- Starbucks announces its closing 600 stores in the next year. Is the demand for $4 lattes dying in a tough economy?" But CBS’s "The Early Show" took the puns and the "doom and gloom" to a new level. Host Maggie Rodriguez teased the headline news: "Starbucks shutting its doors on hundreds of stores. Tough economic times or just a grande letdown?" Correspondent Ben Tracy, in his report on the closings, quipped, "The economic slowdown has been a real grind for Starbucks' profits. After filling up their gas tanks, some coffee lovers don't have enough left to fill up their cups." Suppose you had trees on your property that served as a privacy barrier and provided shade for your home. Then imagine your eco-minded neighbor installs solar panels and demands you cut down your trees so sunlight can reach his panels. You might think: It's my property! The problem is - your neighbor has the law backing him up, according to the April 7 "CBS Evening News." Sounds like a case of environmentalism gone wild, right? 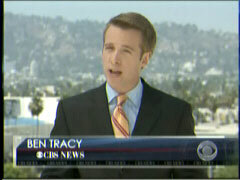 "Richard Treanor lives across the fence, drives a hybrid car," CBS correspondent Ben Tracy said. "Ten years ago he planted these redwoods to provide privacy. Now they had his neighbor seeing red." "He called us over to the fence one day and said ‘I am going to be installing solar panels and therefore you have to take your trees down,'" Treanor explained. And thanks to California's 1978 Solar Shade Control Act, the trees had to go. Failure to comply is a criminal offense. Surprise - another foreclosure hardship story on the national evening news. This time it was the March 27 "CBS Evening News." CBS correspondent Ben Tracy had no difficulty finding one family affected, it's just that they were paid well to be affected. He showcased a family in Oakland, Calif., that had to move due to a foreclosure. "What they did not know is that the owner of the home they've been renting near Oakland, California, wasn't paying her mortgage, and the bank foreclosed on the property at the worst possible time," CBS correspondent Ben Tracy said.